The merchandise in this case is sets of corn cob holders, but the fixtures highlight is the Mobile Wireform Bushel Basket Holder as display. Lightweight and castered, it’s a go anywhere addition to your outfitting requiring only a Bushel Basket to fulfill its promise. In-season, much produce arrives in a Bushel Basket anyway. Between season like this you can merchandise almost anything with just the addition of the aforementioned Basket. 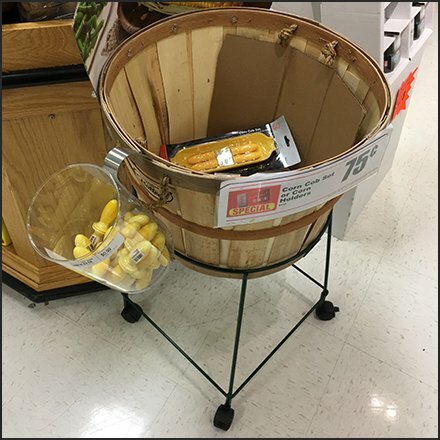 This Mobile Wireform Bushel Basket Holder seen at Weis.